Indian School Road is a typical Albuquerque road: wide and, for most of the day, empty. In fact, Indian School is more empty than the typical overbuilt Albuquerque road. According to the most recent MRCOG Traffic Count Data, Indian School between San Pedro and Broadway handles an average of 10,000 cars/day. The most traffic heavy segment has 14,700 cars/day while the least trafficked segment receives a paltry 7,500 cars/day. This is a five lane road + bike lanes + narrow sidewalks (only 3 feet in some places) / portions with no sidewalks. For my average, I included data not seen on this traffic count map segment. To put that into perspective, San Pedro between Kathryn and Zuni (illustrated below), which currently has a single vehicle lane in each direction + center turn lane + bike lanes in each direction, currently handles 10,000 cars/day without any problem. The black rectangle outlines the portion of San Pedro between Gibson and Zuni where there is a single traffic lane in each direction. Zuni averages 18,000 cars/day and only one lane in each direction, which will soon be the case, will not be a problem. Central Ave. between Downtown and Lomas handles 11,500 cars/day. It recently received lane reductions and most of the day, it is still quite empty. The main difference? Bicycles now fill the new bike lanes where previously it was impossible to ride. Low traffic + many lanes = high speeds. Just think about it. You roll up to the red light. You switch out of the left lane into the empty right lane, queueing up next to the car in the other lane. You look at each other. The light turns green; it’s a race! You both accelerate, trying to get ahead of each other. You pull up to the red light behind the car in front of you. The light turns green. You both proceed, one after the other, going the speed limit. High speeds kill. They kill people in cars, on foot and on bicycles. They kill the possibility for active and vibrant street life. They kill peoples desire to bike or walk, feeding a culture of fear, obesity and car dependancy. We Already Have Bike Lanes and Sidewalks! What Would We Do With an Extra Lane in Each Direction? 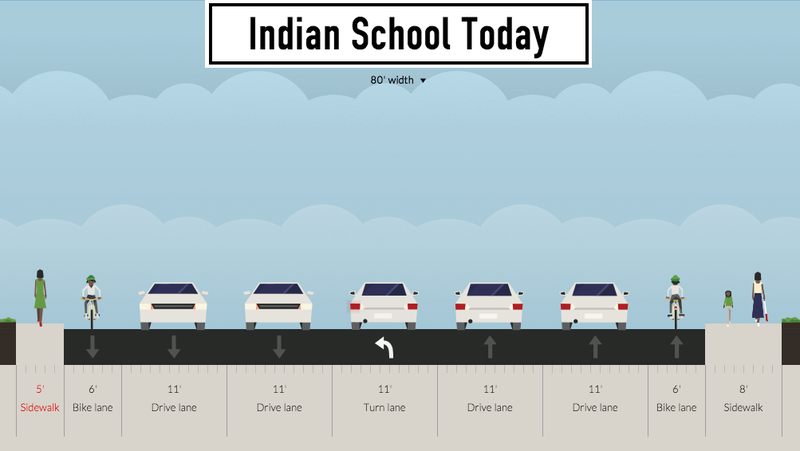 This is how most of Indian School looks today though some segments have even narrower sidewalks. 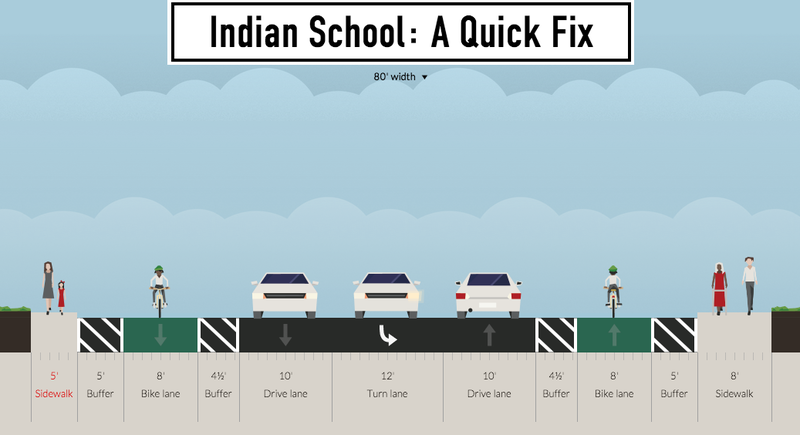 As of today, Indian School is technically a “complete street“. It has a bus route…. which runs only 4 times per weekday. It has bike lanes… narrow and right next to two lanes of fast moving traffic. It has sidewalks… extremely narrow, disconnected and lacking shade or buffer from the fast moving traffic. 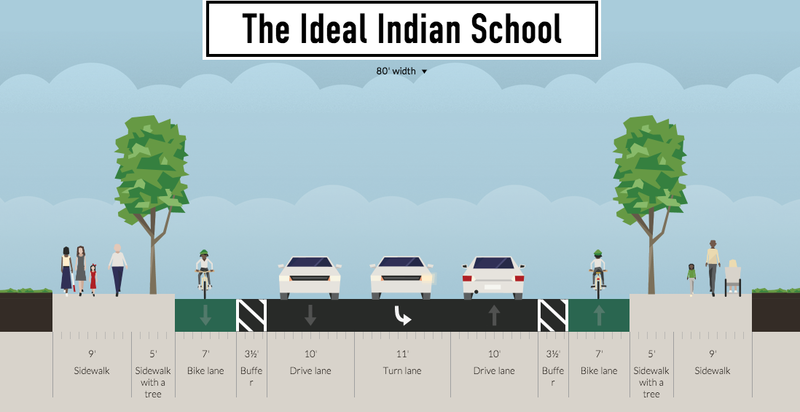 If a lane in each direction was removed, Indian School could become the premier road revamp in the country. The neighborhoods streets surrounding this segment of Indian School Rd. are already well used by bicycles due to proximity to the University. Using Streetmix, an incredible online street visioning tool, I have designed the potential outcome of this project. This could be done tomorrow with paint. For just 1/169th of the cost of the Paseo del Norte project or $135,000 (Source: Wichita Planning Dept), tomorrow, the city could re-stripe the right lane in both directions, slowing down speeds and creating a wide, buffered cycling facility on this four mile stretch. It would be a massive regional mobility improvement for cyclists and pedestrians. The success of this “pilot project” could drive support for the more comprehensive rebuild of the road. 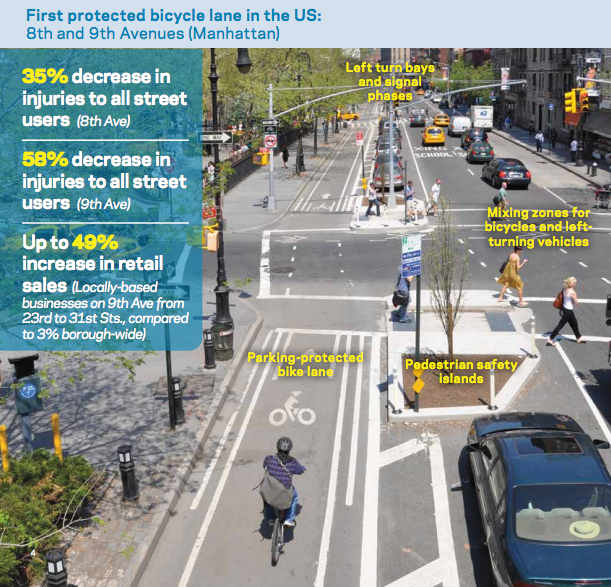 Below is a picture of 8th Avenue in New York City which recently received a similar treatment to the one proposed for this corridor. Click on the image to read about all of the positive impacts of the realignment of this street. This will be a long expensive process but there are many strong arguments for transforming Indian School. The strongest argument, in my option, is economic competitiveness. Every local politician and city leader is obsessed with bringing more jobs to Albuquerque. This is understandable; one could argue that the recession never ended in Albuquerque. Another problem is the retention of young people. Austin, Denver, Ft. Collins, Portland and other cities in the region are drawing young people away from Albuquerque. They are growing, creating opportunities which do not exist here. A major attraction of these urban areas is their vibrant urban cores. What if the city decided tomorrow to do a massive revamp of Indian School? If marketed correctly, the project would gain attention from national websites and news blogs such as Streetsblog and Atlantic Cities. Branding Albuquerque as a national center of walkable progressive street design would be hugely beneficial to our economic standing. Will a green painted buffered bike lane single-handedly save Albuquerque? Absolutely not. However, there is growing evidence that young people and old people and even middle aged people are suddenly more interested in living in communities where walking and cycling are normal, comfortable and rational. The Indian School corridor is already so close to being one of these complete communities. It is surrounded by bikeable and walkable neighborhoods, transit corridors and unique small businesses. The cost to do this project is priceless. We can not, as a community, afford to continue to let motor vehicles rule our roads. Why not finish it right? It can only help our community which so desperately could use it.